My son and I just returned from one of our beloved fall traditions: a long weekend in New York City. I take sublime pleasure in watching JP fall deeper in love with the city of my childhood at every visit: soaking up the street sounds (“I don’t know if I’ll be able to sleep without the horns and sirens,” he told me in all seriousness on the night we got home); quickening his walking pace to keep up with the most seasoned striders; and taking an active roll in navigating us through the city streets, both above and below ground. 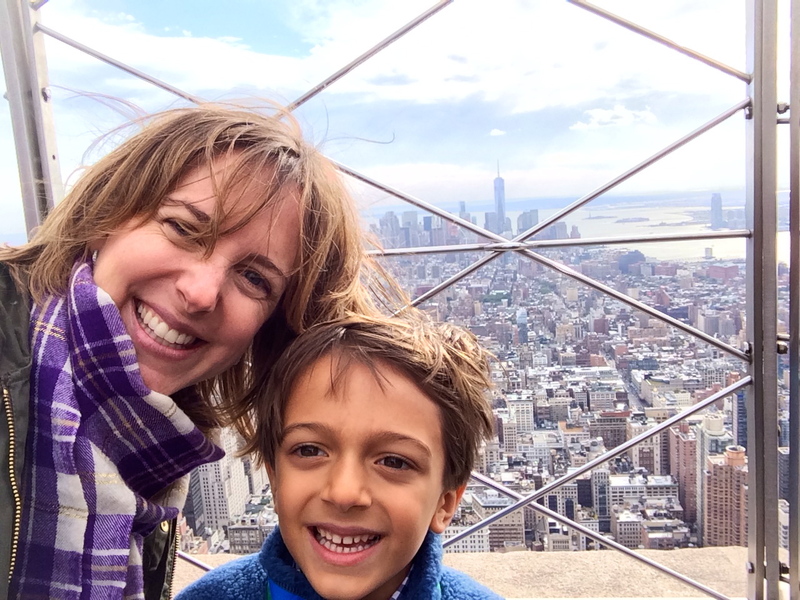 This last point is in large part owing to two things: first, JP’s recent discovery of the NYC subway map; and secondly, his fondness for the Empire State Building, which we summitted on our previous trip to the city. When he is not rattling off the list of upcoming stops on an uptown train ride, he is looking around him on the street for the landmark against which to measure all landmarks. We discovered this past weekend (thank you, Books of Wonder) that there is a new children’s book that marries JP’s love of the subway with the Empire State Building. I’m declaring it required reading for natives and tourists alike. Because get this: it is now MY FAVORITE NEW YORK BOOK OF ALL TIME. This book does what so many others have tried to do: to capture on paper the kinetic buzz of the Big Apple. The architecture, the crowds, the smells, the grit, the swarming sea of colors and patterns and faces—it’s all here. Sanchez’s art is packed with detail, endlessly fascinating, and worthy of repeated viewings. Exactly like the city itself. Did I mention that the opening endpaper is a reproduction of the NYC subway map? JP and I traced our entire four days from start to finish on this thing. Multiple times. A quick word about the publishing imprint, Toon Graphics, in case you aren’t familiar with the groundbreaking work they’re doing in children’s books. Self-described as targeting “visual readers,” Toon originally started with short comic books for early readers (the Zig and Wikki titles, by the same author as Lost in NYC, were big hits with JP just last year). If you have an early reader, you owe it to yourself to get your kid’s hands on Levels 1-3 of the Toon readers. While told through a similar comics lens, Lost in NYC is aimed at a slightly more mature reader. It’s also visually distinct, with a 8” by 10” cover, versus the 7” by 9” trim of the early readers. The story is simple enough: a school class is taking a field trip to the Empire State Building via subway. But the narrative is both layered with information and charged with emotion. For starters, we’ve got the enthusiastic history lessons offered up by the teacher, a disheveled, middle-aged Nutty Professor type. He talks to his students about the Empire State Building (once the world’s tallest building), as well as about the NYC Subway System (once the world’s fastest, with express and local trains running side by side in an unprecedented four-track system). The book’s multi-paged Appendix is packed with more historic details on both subjects, including black-and-white photographs that my son poured over. Secondly, we’ve got the subway journey itself—originating in the Upper West Side, ending at East 34th Street, and connected via the Red Line. At least, that is the school’s agenda. As you’ve likely gleaned from the book’s title, things don’t go exactly as planned. And that’s where the emotional heart of the story comes into play. Meet Pablo. It’s his first day at school. Pablo’s family has recently relocated to New York (when asked where he’s from, Pablo repeatedly insists, “Nowhere. My Dad moves a lot for his job.”) Despite his parents’ effusive send-off, despite the teddy bear in his backpack, Pablo is doing his best to feign total indifference. He doesn’t care about his new school. He doesn’t care about making new friends (what’s the point, if you’re just going to move again?). He’s big on whatevers. When Pablo betrays his lack of familiarity with the New York subway system, eager red-haired Alicia is quick to take him under her wing. So much so that, once underground in the 96th street subway station, she steers him away from the group, towards the giant subway map on the wall—and then, in the subsequent chaos of trains arriving and crowds of people rushing by, they accidentally get on the WRONG TRAIN. They board the Express at the same time that the rest of their class is boarding the Local. Luckily, the lost kids know exactly what to do. Get off at the next stop. Only, oops, Pablo and Alicia get off at the next stop and then immediately jump on the Local, just as their frantic teacher is ushering the others off the Local and onto the Express. Things quickly go from bad to worse, as Pablo and Alicia point fingers at one another and call names, as Alicia tries to get Pablo to admit that he’s lonely and Pablo tries to tell Alicia to bugger off—until, finally, Pablo jumps off the train at 42nd Street and boards a different train line all together, while Alicia begins running up and down Broadway Avenue searching for her lost classmate. It astonishes me that we can feel so much anxiety, suspense, sadness, and exasperation in a story told exclusively through speech bubbles. My heart breaks for the hurt that Pablo is repressing, for the goodness behind Alicia’s naivete, and for the true nightmarish ordeal in which they find themselves. All this is conveyed in the utter absence of narration. Here’s the coolest part: ultimately, both kids need saving, but not in the way that they think. Pablo and Alicia prove to be super resourceful. They use maps, they ask for help, and they both find their way to the Empire State Building via completely different routes from each other and from their classmates. Which pretty much had JP convinced that New York City has the best Public Transportation System in the world (duh). And here’s the tissues-required ending: you’ve never seen two kids happier to see each other in the lobby of a building than Pablo and Alicia. When they both try to take the fall for the other in the face of their irate teacher, you know it’s the beginning of a beautiful friendship. At least, the reunited class can board one of the Empire State Building’s 72 (!) elevators to the rooftop observation deck that overlooks the city. JP declared it super cool to read about something he has done (even if it was so windy while we were up there that he was convinced we were in the middle of a hurricane and that I was trying to kill him and so agreed to pose for only one fast selfie before running back inside). After all, you have to admit it’s a pretty great view of a pretty great city. Especially if you have someone special to share it with. Other great NYC-themed reading can be found at the end of this post. So how do you read this–is JP reading to you? Is he reading it on his own? You’re both reading different characters? I’m always at a loss with these speech bubble books, though this one looks great! It’s a great question. As I mentioned in my recent post on the Mr. Pants graphic novel series, I normally abhor reading aloud speech bubbles…but with a few notable exceptions, Mr. Pants being one. With Mr. Pants, I insist on reading all the characters myself because I’M SO DARN GOOD AT IT, but in the case of Lost in NYC, I was happy to let JP make the call. He likes it when I read all the girl parts and he reads all the boy parts, and so that’s what we did with this one. He then read it to himself several more times. It’s a book that sort of demands sharing, because there’s so much to look at and discuss. And the Appendix is really rich with additional information (I had to read that to JP). Hope that helps! Love the coverage on this book and the exciting side story of your personal adventure with JP! You are currently reading New York City From Above & Below at What to Read to Your Kids.